Anonymous, 13 Oct 2013Have a suggestinon for gsmareana. Do the test again. Don‘t post the name of the phone on the p... moreif i rmb correctly, last time they did that, wonder y they din do it anymore? Have a suggestinon for gsmareana. Do the test again. Don‘t post the name of the phone on the photos. Then let everyone rank these photos. Finally, post the name of the phones. It will be fair this way. +1020....it is way ahead. And the rest are grumbling and bickering 2nd place. kastana, 12 Oct 2013It doesn't make sense that the review is based on the cameras capabilities. I personally woul... moreppl like u r funny, GSMArena go tru the hassle to have a shootout, though it may not be super thorough but it is a comparison about the camera capabilities! if u dont like it, then dont read it. 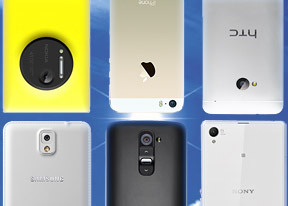 all these r flagships and they have their own review, go read them urself and stop bashing GSMArena for no reason! AnonD-124528, 13 Oct 2013Well it has more pixel xenon flash ois and everything like a camera so of course Sony cant bea... moreDrop the design? Have u seen the design of 920? 925 928 and their other,phone,that wont break,even,though it fell,soo hard? [deleted post]Its a shootout between 5 smartphones and one smart camara. Lumia 1020 is just a camara that can do some functions of a smartphone. L1020 smokes the competition away. Z1 and Note III are distant seconds. kastana, 12 Oct 2013It doesn't make sense that the review is based on the cameras capabilities. I personally woul... moreThe review's title itself is self explanatory .. Six-way camera shootout: Smartphone roulette. It was a camera review, what else do you expect? Lol, best of Sony is not best here. Nokia has always been impressive. Gsmarena you did a great job in this comparison, and the comments prove it. However, I'm sure you noticed the huge disappointment about ranking the note 3 above the Z1, I mean it obviously didn't make any sense. I don't want to blame you as bias to Samsung, but please we need more credibility here, and you should leave your own preference elsewhere. thank GOD finally a fare comparison... i m sick of iphoneareana who are and who will always proclaim iPhone 4,,5 and 5s etc are the best and will be the best 1 from them......i love the camera of 1020 and the build quality,OS(better than ios but after android),offline navigation but once again the problem is the apps.... all major apps firstly come to overrated and overpriced iPhone.... and then android.... i wonder when they will come to windows phone.... plus i have s4 because of android and main reason is the apps... but camera wise Samsung :@:@:@:@ disappointment big time .... i hate camera of Samsung .... !! !